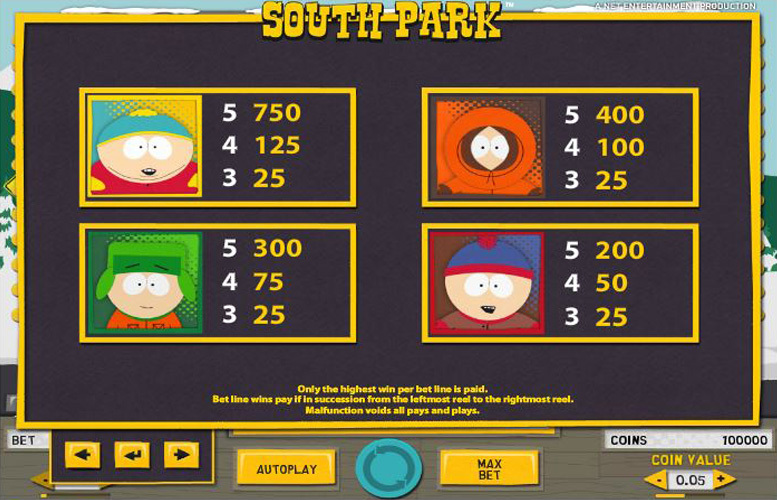 Based upon the popular cartoon, South Park is a five reel and three row slot game with a theoretical return to player percentage of 96.7% and 25 pre-set paylines. Players can choose between ten different bet levels and six coin values from 1p to 50p, and can also benefit from wild substitutions, three mini-features and no fewer than four different bonus games. Fans of the TV show are sure to enjoy the South Park slot but if you still aren’t sure whether it is the game for you, our full review can help. It will cover the game’s top jackpot, special symbols, paytable and betting limits, to give you everything you need to know. 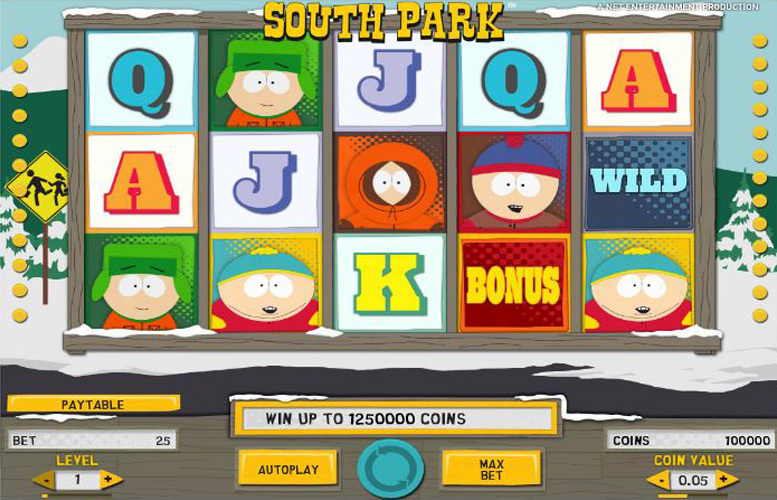 One of the main selling points of the South Park slot is its wide collection of different features and bonus games, which all introduce different ways to win. In general, however, the main way of achieving payouts is via the main slot and seeing winning combinations line up along the game’s 25 pre-set paylines. The most valuable combination which can be achieved comprises five Cartman symbols and is worth 750 times the bet level. At the highest bet level of ten that equates to a payline jackpot of 7500 coins. If the combination were to appear across all 25 paylines at once, therefore, that results in a total jackpot of 187,500 coins which at the highest available coin value of 50p is worth £93,750. 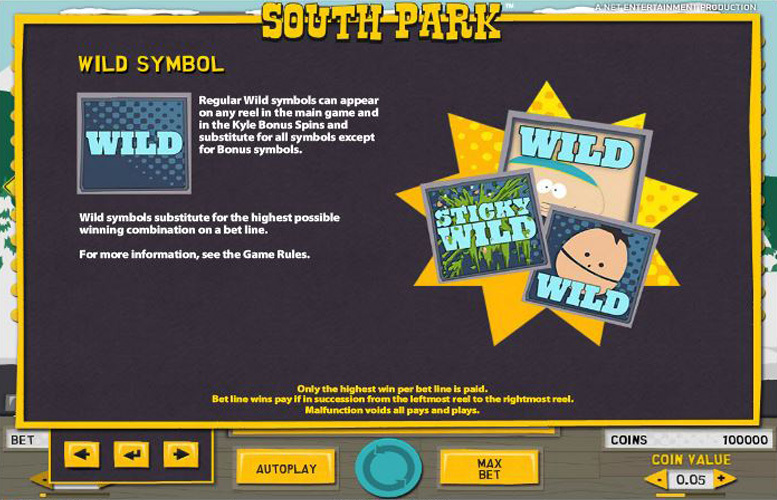 The gameplay of the South Park slot features two categories of special symbol, in the shape of its Wild symbols and its Bonus symbols. Wild Symbol – the Wild symbols can appear on any reel during the main game, substitute for all other symbols except the Bonus symbol and always go toward making up the most valuable possible combination for a payline. Bonus Symbol – normal Bonus symbols within the game can appear anywhere on reels three or four and, in combination with the Character Bonus symbols which appear on reel five, work to activate the slot’s four bonus games. A bonus game is activated if three symbols appear consecutively from reel 3 to reel 5 and which game it is depends upon which character is shown by the Character Bonus symbol on reel 5. The four different bonus games are called the Kenny Bonus Game, Kyle Bonus Game, Cartman Bonus Game and Stan Bonus Game, and their individual rules are explained on the South Park paytable. Only one of the games can be active at any one time and all coin wins from the games are proportional to the bet level of the spin which activated them. As well as those bonus games, South Park also includes three different mini-features. Those features are called the ‘Terrance and Philip’, ‘Mr Hankey’ and ‘Cartman’ features, are randomly activated and are also explained in-depth in the game’s paytable. The most valuable symbols within the South Park slot are those displaying the show’s four main characters, and it is the Cartman and Kenny symbols which are more beneficial than the other two. The Cartman symbol is the most valuable of all and pays out at a rate of 750 times the bet level for a five symbol combination from left to right across a payline. At the maximum bet level of ten, therefore, that results in a 7500 coin payout per payline and a top jackpot of 187,500 coins if the combination appears on all 25 paylines. The Kenny symbol, meanwhile, is worth 400 times the bet level for a five symbol combination which returns a payline jackpot of 4000 coins at the highest bet level and an ultimate top jackpot of 100,000 coins. 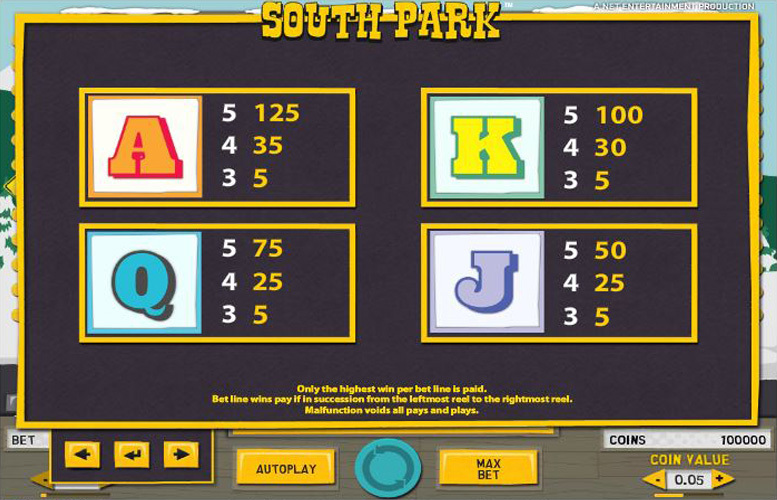 South Park is a slot game with 25 pre-set paylines but players can still alter the amount they stake per spin by choosing both their coin value and bet level. Bet level determines how many coins they bet per payline, between one and ten, and coin value dictates how much each coin is worth from 1p to 50p. The minimum possible stake for a South Park slot player, therefore, is just 25p and the maximum is a total of £125. Those totals are achieved by selecting the minimum possible bet level of one and coin value of 1p and the maximum bet level of ten and coin value of 50p, respectively. Fans of the popular South Park cartoon will undoubtedly enjoy playing this slot but there is plenty for other players to like about it too. The potential jackpots provided by the game compare well with most other games that are available, and the provision of numerous extra features and bonus games offer many different ways to enhance those winnings. Those many bonus games and features, too, help to make this a fun and interesting slot which has far more immersive and exciting gameplay than many of its competitors. Players, too, are likely to be grateful for the many different betting options which they can select thanks to the adjustable bet level and coin value. The only real downside to this game, therefore, is that its overall theme will almost certainly only appeal to those players who are already fans of the TV show and will not be particularly entertaining to anybody else. This game has a rating of 3 / 5 with 183 total reviews by the users.